You must make reservations at least 5 minutes in advance of the time at Griffin Tavern. Griffin Tavern is a casual dining restaurant with three cozy dining rooms, a “cheers” style Pub where friends and strangers mix and mingle and a wonderful outdoor area for seasonal dining(dogs on leashes welcome outside). We also have rooms upstairs that are perfect for private dining, small functions, and business meetings. Griffin Tavern is internet friendly with FREE WiFi access. 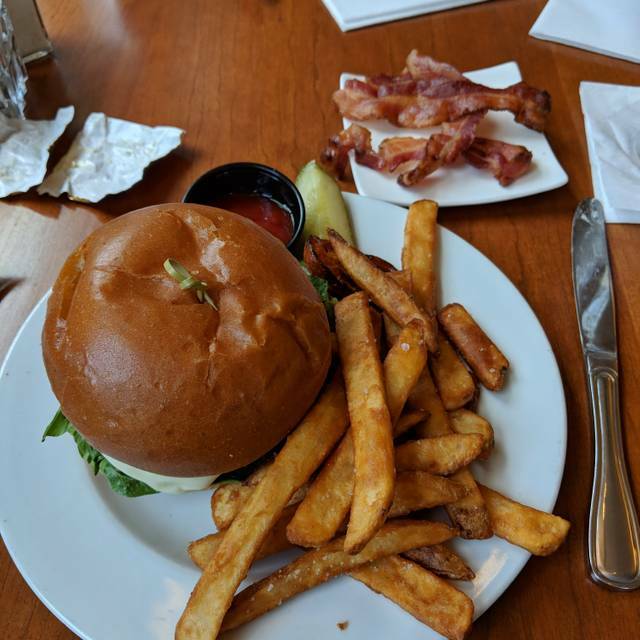 Our menu features home-style cooked meals and pub favorites using fresh ingredients and local products: Fish n’ Chips, Shepherds Pie, Great Hamburgers, Seafood and Steak specials, as well as gluten free options, affordable appetizers, salads, and a Children’s Menu. Served with French Fries and a Pickle Spear on the side, an Organic Chicken Breast can be substituted or a Beyond Meat™ Burger for $1 extra. Kimchi, Bacon and Spicy Mayo, get ready for some heat! Yet another great meal, great service, and wonderful atmosphere. Special, extended thanks to the wonderful Baker who made a Dalmatian Cheesecake special for us ... on Easter weekend! The efforts are always greatly appreciated and Griffin Tavern never fails to deliver. Great place to meet friends for slow a slow pace dining experience where you won’t feel rushed. Wait staff is limited so don’t expect quick in and out experience in the dining area but the food is good and the atmosphere is flexible. Choose the bar area, dining room, or outside porch. Another great meal at Griffin Tavern. I was sorry they didn’t have their great crab cake on the menu but enjoyed the salmon very much. As always the service was great — prompt and friendly. We especially enjoyed the treat of a warm cookie at the end even though we weren’t playing trivia. My husband and I dined at the Griffin Tavern on April 10. The calamari was delicious. We also split a green salad which was fresh and very good. I ordered the crab cake, which unfortunately, they were out of, but I had the ribs instead which were good. My husband had shepherd's pie which was excellent. The only real complaint we had was that it was too noisy. 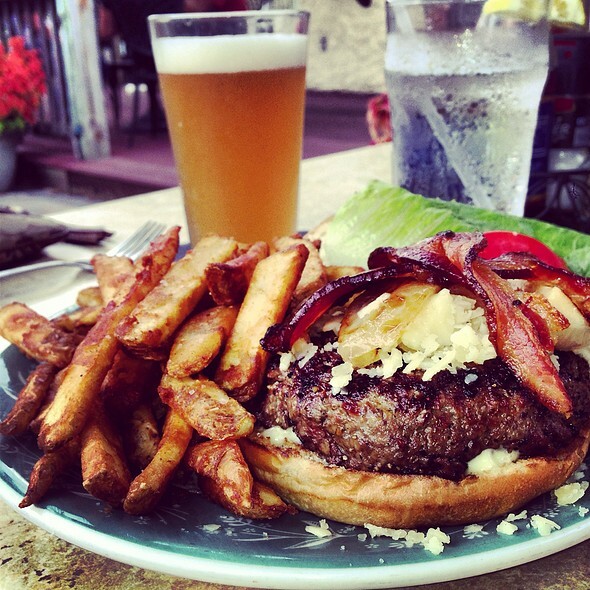 We always have good food and a nice experience at Griffin Tavern. In the Tavern on a rainy day or outside on the porch on a nice one. We love it! I took my mom there for a birthday lunch. I kept telling her how good the burgers were so decided to let her try them for herself. She was not disappointed! Good food with good service. Nice “local” spot. This was a pub downstairs but was a charming restaurant upstairs. The food was good with a British flair. I would recommend this place for a casual night out. Everything was great!! As usual! The food, the people, the atmosphere, the music! We will go AGAIN! You are missing out if you don't stop in. The live music and Lorraine the bartender are awesome!!!! Great burgers & fries. Like the pub atmosphere. Service prompt & friendly! Food was delicious and the Staff is Great. We have never been upstairs before and it was very nice and cozy, plus we got to look at the beautiful artwork they had upstairs. 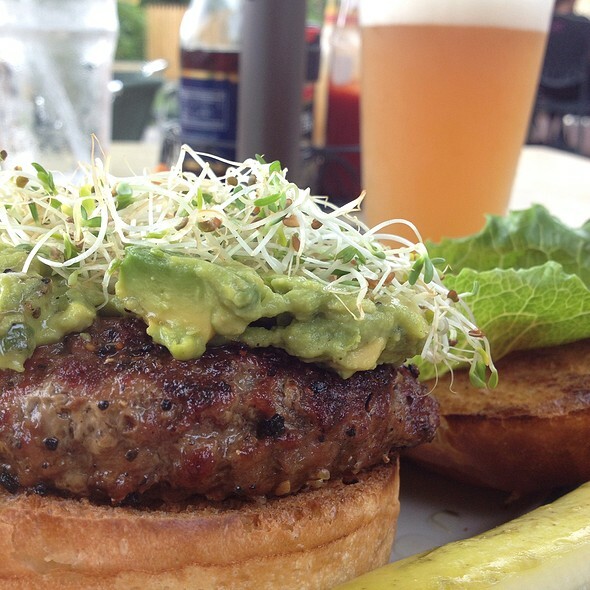 We always enjoy going to Griffin Tavern, because there is always something new on the menu to try. Just a super spot in Country side. Our server, Christine, was phenomenal! She was knowledgeable, personable, and made sure our table had everything we needed. The Sunday brunch was sooooo good. The kids loved it as much as the adults! Great variety of menu items, great ambience and just an amazing vibe. Highly recommend the drive out to Griffin Tavern. It was fairly quiet, but with nice live music. Fairly well decorated, with good food, and great service. It was a great experience and I recommend it. Great home town ambiance, friendly local bar and restaurant. Service was very friendly and personable. Food was good, and what you would expect from a decent local bar, but Fries were hard and not fresh would be my only “semi” complaint... not enough to come off of 5 stars. Highly recommend, especially if you want to engulf in the local atmosphere and enjoy a solid meal, which is exactly what we wanted, and got. Very nice place, great menu, nice people. Always a joy to dine here. Yes, this is worth the drive from DC! Griffin is full of local folks and day-trippers like me are welcome. The kitchen does everything well, the drink selection is great, and the service is warm, genuinely friendly, and smooth. The drive is scenic, and the destination well worth the trip! 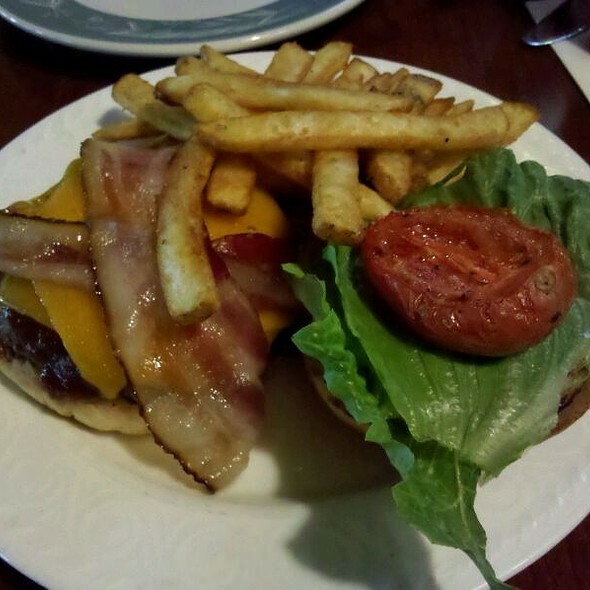 We have been to the Griffin Tavern a number of times, and have always enjoyed the food and the staff. While the building is charming, we have often been seated in the enclosed porch, which in winter is so cold that they offer blankets. Additionally, despite having asked for a quiet table, we have been seated twice at the table next to the glass door separating the porch from the bar. The music and noise from the other side does come through. We will continue to enjoy going there, but the noise is a definite drawback. All of our food, apps and entrees, was delicious. It was my birthday, and they gifted a lovely dessert as well. I was also impressed by the beer menu and wine list ... neither was extensive, but there were very good choices. A happy surprise we found while out and about with family. Located near a few local wineries, it was the perfect spot for a lovely lunch. Food was delicious and the staff were delightful. Highly recommend if you are in the area! Historic setting. Great bar and live music. Thai dish (seafood) was outstanding. Table seating suitable for special ocassions. Nice mix of locals and weekend visitors. Unexpected treasure off the beaten path. I ate the eggs Benedict with crab and it was just divine!! So enjoyed my lunch there. Stopped for an early dinner after an afternoon at a winery. Picturesque location in a quaint town. Prompt and courteous service. Nice selection of American comfort food, which was quickly served. The fish and chips and the shrimp with grits were excellent! Another wonderful evening with good friends, great food and attentive service! Love this place. Great food, good service. Very few restaurants in the area. The atmosphere was good and the service was great. The appetizers were good the steak was not the right choice. No flavor and not prepared well. Would recommend the restaurant as one to try while in the area. Food and staff always a pleasant experience! A terrific dining spot. It was a great meal, outstanding service, and great ambiance. I highly recommend this restaurant. Nice place to stop for a pub lunch in gorgeous countryside. Loud football game played over stereo at outdoor tables was not so nice. Food was good. We used to come here often, but haven't been in a couple of years. It was really nice coming back, as they have a very good dinner menu and still have their awesome bar menu, just noticed no more pizzas? But the burgers were still amazing! Looking forward to coming back more often! Enjoyed a nice dinner with friends after activities in Little Washington. We were able to have a nice conversation, as the noise level was not too high. The waiter was very attentive. Good ambiance. We all had something different & all dishes were fantastic! Sumptuous peanut butter cake for dessert! We all enjoy eating here. Had a delicious dinner and then moved to the bar for outstanding live entertainment. The Tavern is comfortable, the staff is very friendly and the food is great! PS- the bar crowd is nice and friendly,too! Our friends, who had never been, loved it,too! Recently my wife and I dined at the Griffin Tavern twice. One time was much busier than the other. The service was fantastic both times. Meals ranged from shrimp and grits to fresh fish prepared with vegetables in parchament to hanger steak. All entrees were prepared perfectly. Appetizers, desserts, wine and beer were excellent as well.